Sometimes, at dawn or at dusk, I pick out from the gloom — I think I do — a certain figure, traversing those rutted fields in a hushed and pearly light, picking a way among the treacherous rivulets and the concealed ditches. It is a figure shrouded in a cloak, bearing certain bulky objects wrapped in oilcloth, irregular in shape: not heavy but awkward to carry. This figure is me; these shapes, hidden in their wrappings, are books that, God willing, I am going to write. But when was God ever willing? And what is this dim country, what is this tenuous path I lose so often — where am I trying to get to, when the light is so uncertain? Steps to literature, I think; I have tottered one or two. I was engrossed in Giving Up the Ghost from beginning to end, but I was also disappointed with it almost as consistently. Why? Because I thought it would be a different kind of book, and I had a hard time reconciling the book it was with the book I wanted it to be — namely, a memoir about a writer’s life. I sat behind the insect mesh of my veranda frowning over my card index, documenting the fall of the French monarchy, the rise of the Committee of Public Safety. I had pressed the juice of meaning from every scrap of paper I had brought with me, every note on every source. The book was finished now. I went home, to the dark, enclosed rooms of our city apartment. I cut my dose by a third. Bald, odd-shaped, deaf but not defeated, I sat down and wrote another book. That’s all we get there. And then about 20 pages later, again, “I sat in my stifling upstairs room, coaxing out of my computer the novel concealed somewhere in its operating system.” These are “steps towards literature,” sure, but what kind of steps, to what kind of literature? Why doesn’t she even name the books? Clearly Mantel did not consider Giving Up the Ghost the place to talk about her books — at least, not directly. Perhaps the most revealing thing she says about being a writer is a passing remark about Jane Eyre: “I remember the first time I read Jane Eyre: probably every woman writer does, because you recognize, when you have hardly begun it, that you are reading a story about yourself.” But again, she just moves on, so it’s not just her books she’s not talking about, it’s her whole experience of being a writer, a woman writer, a person writing, a person thinking about books, which — though we know they are integral to her life — seem oddly peripheral in her life story. Giving Up the Ghost is not a book about the life of the mind. There’s nothing in it that helps me understand how, much less why, this particular woman wrote A Place of Greater Safety, much less how she would come to be the author of Wolf Hall and Bring Up the Bodies. Giving Up the Ghost is not a kunstlerroman, then, as far as I can tell; it offers no clear insight into Mantel the artist. (It also does not tell an uplifting story of becoming a writer as a way of transcending the social and physical hardships she recounts so vividly — this is not an Oprah-friendly “rising above it” book.) Maybe Mantel believes her novels should speak for themselves; maybe she’s deliberately frustrating attempts to connect the writer and her work, (not entirely unreasonable for a woman writer). I shot past it effortlessly. Soon there was nothing in the secondhand shop to fit me; bigger women don’t discard fashions so lightly. The assistants — and hadn’t I been their best customer all summer? — began to give me the smirk, half commiserating and half condescending, that would soon become the usual expression of shop girls when I went to get clad. My skin turned gray, shading to slate blue as the autumn came on. My legs swelled and ached. Fluid puffed up my eyelids. Some mornings my head looked like a soccer ball. I was glad when my husband’s job took us to Saudi Arabia, where women wear drapery rather than clothes, and where no one knew me, so that no one could stop me in the street to say how well I looked; where, in fact, I was more or less prohibited from going out on the street at all. I could stay indoors, under artificial light, waxing like some strange fungus. “We can be made foreign to ourselves,” she observes, “suddenly, by illness, accident, misadventure, or hormonal caprice.” These extreme side effects, though, only exacerbate an alienation she seems always to have lived with: there’s something slightly disconnected about her self and her body from the beginning, as if she never entirely recognizes herself (one of the more interesting aspects of her childhood is her discomfort with her gender, her belief that at some point she will turn into a boy, then her disappointment as she realizes that she’s stuck being a girl, even though she never can see the point of dolls or tea sets). Her memoir is literally visceral: it’s the story of her guts gone awry. But maybe that means it is in fact a book about the life of the mind, since endometriosis is a disease in which cells from the lining of the uterus make their way to other parts of the body, including, she tells us, “the heart, the head.” One of Mantel’s symptoms is “the prodromal aura of migraine headaches,” which brings on “invisible presences and the echoes of strangers’ voices . . . morbid visions, like visitations, premonitions of dissolution.” These are mental but also physical phenomena; this is, we could say, the irrational life of her mind — the mind that sees “the ghost of my stepfather coming down” the staircase and other things that “aren’t there.” Isn’t seeing things that aren’t there precisely what a novelist does? Giving Up the Ghost tells us very little overtly about Mantel the novelist. But it shares many of its preoccupations with her novels, including ghosts, or just the uncanny, such as the mysterious apparition that haunts her life with shame as if she’s committed a sin (“I should not have been looking“) for which she must somehow answer. It’s also, and this is endlessly evident in its language, by Mantel the novelist: it’s smart, strange, surprising, sideways, grim, tactile (“waxing like some strange fungus” indeed). 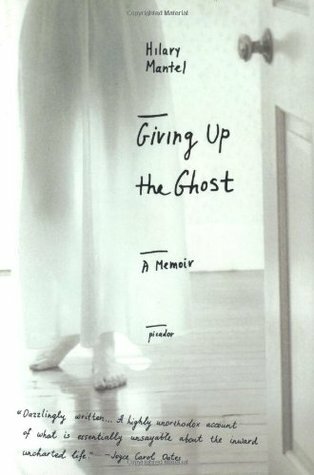 Maybe that’s the point at which the two books (the one I wanted, the one she wrote) actually converge: Giving Up the Ghost isn’t a memoir about being a writer, but it’s very much the memoir of a writer, one whose cerebral life is self-consciously embodied. I wondered, as I reached the end of the book, why I wasn’t at least as curious about her physicality as I am about her intellect, why it kept seeming to me that she was focusing on the wrong thing. My mistake. I remember reading some of Mantel’s early work, EIGHT MONTHS ON GAZZAH STREET, which I read during a fatal heat wave in Greece. It was fitting. I remember thinking at the time, and especially after I read a few more of those contemporary novels she wrote, that she had great insight into body-image illnesses, especially anorexia. And anorexics are quite lacking in affect, kind of bloodless, have difficulty working up any emotion. And definitely, even though obsessed with the body, tend to be EQ-deaf and cerebral, high-achieving, highly intelligent too. Maybe that’s what comes across in this memoir (which languishes in my basement, after I recoiled from its first page), that she’s carried over from her early work? I’m intrigued by what you said about intellect and emotion (I feel this way about some, but not all, of A. S. Byatt’s fiction, too). I wonder if part of what makes George Eliot great is that she is an intellectual writer who doesn’t tidy away all the emotion? Although she certainly doesn’t milk ALL the melodramatic emo potential in her plots, either. That’s so interesting, Miss B–there’s a story about an anorexic narrated by her sister in ASSASSINATION OF MARGARET THATCHER, and none of the narrator’s emotions are directly expressed either, though you can infer them. Oh, I absolutely loved this because I found it so well-written. And if Mantel is a rather cerebral author, then that’s because her emotions are to be found here, in the messiness of her own, visceral life. I do believe that some of the greatest authors write from a place of damage, but that part of their greatness resides in not writing the emotions of that damage into their books in an obvious way. The pathway between experience and art in a real artist is too complex to be mapped like that. I was reading a book about crisis intervention in therapy and a phrase leapt out at me: ‘the explained life is not the lived life’. Somehow I feel that’s relevant here. George Eliot is a heavyweight explainer – she explains every little emotion or thought her characters have. Whereas Mantel doesn’t explain much of anything, doesn’t seem as interested in explanation as in the evocation of a lived experience. Maybe that accounts in part for the expectation shift you had to undergo with the memoir? I was also surprised both by what this book is and what it isn’t, but the advantage I have, I suppose, is that I didn’t have a notion of what it would be–and so couldn’t have my expectations disappointed. Well, I had one expectation, because it’s Mantel; I expected it to be incredibly well-written and it was. And that was more than enough for me, though I did enjoy how relatively out of control the narrative seemed (and even if that was an affectation, I’m fine with it; it convinced me). All that said, a book about the context in which writing novels occurred, rather than about the actual writing process, makes perfect sense to me–because of the unlikelihood of being able to write under such physical and mental duress but also the necessity of doing so, in her case. It seems to me that Mantel, apart from all the illnesses and misapplied medications that made her go a bit insane, was already so smart she was nearly crazy–and all that mental activity must go somewhere. To me, it’s a messy and confusing and irresistible book about that intelligence finding its twisted path through all the roadblocks of illness, class, gender, and familial breakdown. You’ve convinced me I must read this – for which, in advance, many thanks. Illness as severe as the form of endometriosis suffered by HM always entails facing multiple and profound loss. In her case: youth and the beauty that went with it; mobility; social acceptability and – of course – the possibility of motherhood which, as a cradle Catholic, would have probably always been on HM’s mind one way or another. Perhaps, as you suggest, that meant escape into full-time, lengthy and arduous research-based writing was her only positive way out. It certainly resulted in a trio of fine novels (I’m not a great fan of her contemporary fiction; but ‘A Pl.ace of Greater Safety’ and the – so far – pair of Thomas Cromwell novels are rightly celebrated). HM would doubtless have found herself almost entirely excluded socially. There’s a culture of victim-blaming in the UK, allied with some thoroughly peculiar priorities (compared with e.g. those prevailing in France, Ireland or Denmark). Having an incurable form of cancer has lost me friends + ensured that I, a newcomer to provincial England, am a pariah. I sometimes feel like yelling at people ‘It’s not effing catching, y’know!” and “No, I didn’t bring this upon myself!” HM altogether a tougher animal, not to mention more comfortably off + blessed with a loyal and understanding partner, is in a position to cast a cold eye upon the whole damn thing and treat it with sturdy defiance (‘why should I explain everything to you, reader? Do some of the imaginative work yourself, why don’t you?’).